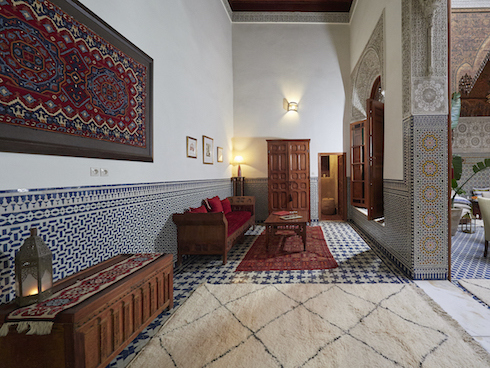 Dar Roumana is within the Medina of Fez. I had been to Morocco one time before, also for work. That was in Casablanca, working for Harvard, you can read about it here. I wouldn’t say I am a fan of Casablanca, my disappointment compounded because I loved the film. The reality is that it’s very noisy, dirty and for the most part kind of charmless. Fez on the other hand was is more captivating, disorienting too, the world’s biggest maze. The first night I got a whirlwind tour through the labyrinth of the Medina, popping into a beautiful and mysterious riad owned by French friends of the client. We walked into a candle-lit space where the owner and some guests were laying on carpets, picking at hors d’oeuvres, drinking wine and tea. The casual elegance, with a dash of ennui that epitomises Parisians. From there we went to eat at a Thai restaurant called Maison Moi Anan that may well be the best one I have visited. The owner grows a lot of the produce and the quality and flavours had the freshness that bore this out. Maybe an odd choice for a first night in Morocco, but what the hell, I could have eaten there every night. So back the reason I was there. I was going to be staying at Dar Roumana and photographing the place which had recently undergone so major renovations. Jennifer is the owner, a North American woman. She has owned the building for maybe 15 years, at least 5 of which were spent rebuilding the place. The place is a palace. I had a room that was the size of my apt in Barcelona (well almost). The ceilings could have been 4 metres at least, which in the winter meant the spaces are pretty cold without heating, but when you are in a bed that is so big with quilts so thick and soft, the cold is not really a problem. Motivating yourself to leave such an idyll is. I was there to work. So, I spent about 8 days working around the place, photographing the rooms, details, and we finished with a party to celebrate the reopening. I also got out once in a while to capture the atmosphere of La Medina and ended up completely lost every time. The thing to remember is that there are really 2 Medinas; one of the day and the other of the night. Mastering one does not guarantee you will not get lost in the other, half your points of reference will have disappeared come night fall, when the shops and stalls have closed.